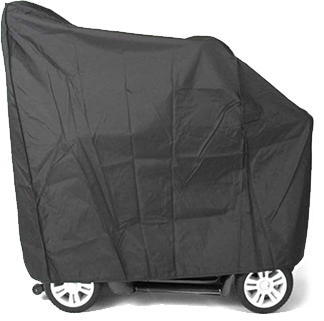 Receive a Free Weather Cover when you purchase an outside vehicle lift of $500 or more. What are the different types of vehicle lifts? Utilize existing third-row seat hardware. No drilling! All outside lift models require the vehicle have a hitch installed. The compatible hitch class is stated on the product detail page for each lift. All outside lifts will work with either a Class II or Class III hitch, although you may require a hitch adaptor on certain models. You can select the appropriate hitch adaptor during the product customization process. 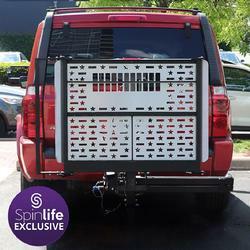 Spinlife also carries three lift models that will work with a Class I hitch. The hitch class should also be marked somewhere on your hitch. * Class I and II hitch receivers have the same dimensions but are NOT interchangeable. Class I hitches have a lower weight capacity and more shallow receiver, incompatible with longer Class II shanks. Need a hitch for an outside lift but not sure which hitch will work on your car? We recommend you use U-Haul's handy hitch selection tool to find the hitch options available for your vehicle. Find vehicle lifts that work with your car, truck, or SUV! Like the name suggests, outside manual scooter lifts attach and stay outside of your vehicle. These lifts attach to a hitch on the back of your vehicle, and some models can hold up to 500 pounds. A more economical choice, these lifts are manual, which require more strength on the user’s end to control. These lifts are similar to outside manual scooter lifts, but are powered, taking a great deal of strain out of transporting your scooter. Outside powered scooter lifts attach to a hitch and are wired to the vehicle’s battery. Our selection of outside powered scooter lifts take very little effort on the user’s part to control, with some models carrying up to 400 pounds. Unlike outside scooter lifts that attach to a hitch, these inside scooter lifts bring the scooter into the back of your vehicle. All inside scooter lifts that we carry on Spinlife have powered lifts, and some models have power rotation for easy transfer in and out of a vehicle and a carrying capacity of 400 pounds. Inside scooter lifts have both economical and higher end models to meet your scooter lifting needs. Buy mobility scooter lifts with confidence at SpinLife! We carry top brands for outside manual scooter lifts, outside powered scooter lifts and inside scooters lifts. Not sure which scooter carriers are right for you? Call our ProductExperts, and we'll help you determine the best fit. We also offer free shipping and a 30-day money back guarantee on lifts for scooters. Scooter lifts and scooter carriers aid you in transporting your mobility scooter in your car. At SpinLife, we have everything from mechanical solutions, such as the E-Z Carrier models, to fully-assisted power models that simply require the push of a button (such as the Pride Backpacker Backpacker). 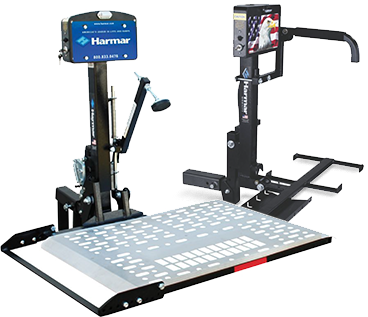 Some scooter carriers function with a hitch installed on the rear of your vehicle (like the Harmar Wheelchair Lift), while other scooter lifts assist in moving your product into the truck of your car or back of your van. If you need assistance finding the right solution for your needs, we encourage you to give our experts a call. We will assist you in finding the right model to meet your precise lifting needs. Call now, and we will determine the ideal solution for your needs based on your vehicle and your particular needs. How can I make sure the lift will work with my vehicle and my scooter? Call our expert staff and tell us your vehicle make, model, and year, and the scooter you plan to lift. We can tell you if the combination will work. If you place your order online, the site will ask you for your vehicle and scooter or wheelchair information during the ordering process, and our team will make sure the combination works before your order is shipped. Most manual wheelchair and scooter lifts can be installed yourself. 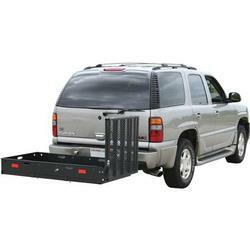 Manual lifts, like the EZ Carrier line, slide into a hitch on the back of your vehicle. Need a hitch? SpinLife recommends using U-Haul for hitch installation (click here to visit the U-Haul Hitch site). 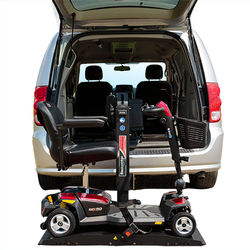 Electrically-powered wheelchair and scooter lifts may require drilling into the trunk or storage space of the vehicle, or wiring the unit directly to the car battery, so SpinLife recommends that a reputable auto mechanic or U-Haul location install the power car lifts. One exception is the BackPacker lift from Silver Star. It easily attaches to the third-row seat hardware in many mini-vans, and can be operated using a rechargeable battery, making it a snap to install yourself. 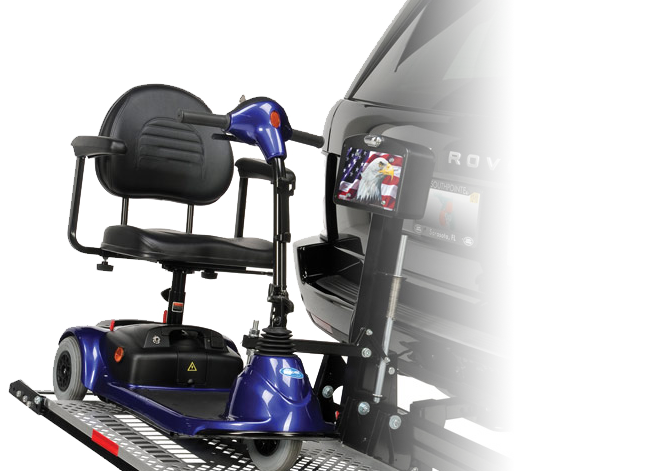 Also, all Silver Star Wheelchair and Scooter Lifts by Pride Mobility include the option of Expert Nationwide Installation, and SpinLife will coordinate the entire installation process. No, these items are not a qualifying purchase for Medicare reimbursement. SpinLife is here to support you throughout the life of your purchase. We honor all manufacturers' warranties. If you run into trouble, give us a call and we will get it taken care of for you. SpinLife wants you to be completely satisfied with your purchase. If it arrives and it is not what you thought or does not meet your needs, you are free to return it as long as it is in new condition and the original packaging. When returning a lift we require that you pay freight and a 15% restock fee to return the purchased item. Please see our Return Policy for complete details.